Why are staff turning to IM? Financial and staffing pressures are weighing heavily on the UK’s public healthcare bodies. To keep up with increasing demand staff are working extra hours under increasing stress just to keep the system from collapsing. It will come as no surprise that staff are using technology to make their lives easier whenever possible. A report carried out by CommonTime this year found that 43% of NHS staff reported using an instant messaging app on their personal mobile for work purposes. Whatsapp proved most popular being used by 29% of all staff. Staff at Community Trusts are most likely to use messaging apps, with 49.7% using at least one. This is followed by Ambulance (42.1%) and Mental Health Trusts (41.3%). This comes as no surprise as staff are able to quickly and easily send information about clients while away from a computer and can instantly send photos without having to first upload them. While messaging apps like Whatsapp and Facebook Messenger have built in encryption they are not designed for sharing confidential information. These apps are not password protected. If a device is unlocked and accessible all messaging history and shared information would be clearly visible. An app for sharing client data needs a robust login with secure passwords and multi factor authentication. The easiest way to share a photo with someone is to take a picture on your phone and send it to them via a messaging app. Many apps use cloud based storage to automatically backup photos and content. Cloud based sharing can be made available to friends, family and even made public posing a risk that sensitive pictures could be leaked. In some cases it may be possible to identify a person from a picture and their privacy may be violated. In a conventional system all conversations about a person are stored against their records. There is a clear trail of contacts and actions. In a messaging app these are not attached to a client file so key information could easily be missed. Also, any content from a messenger app can simply be deleted. Apps like Whatsapp remain free by collecting information from your conversations and profiles and selling this to external companies. This can mean sensitive information is falling into the wrong hands automatically with no user defense against this process. The first option would be to ban the use of instant messaging apps in services altogether. However it can be hard to monitor compliance and many staff may risk the repercussions in order to keep the benefits an instant messenger brings. More healthcare friendly messaging apps are starting to appear on the market. These offer secure messaging and sharing of client data. Everything will be kept safe and secure in one place with a clear audit trail. You will have all of the advantages of instant messaging, for your staff and clients. 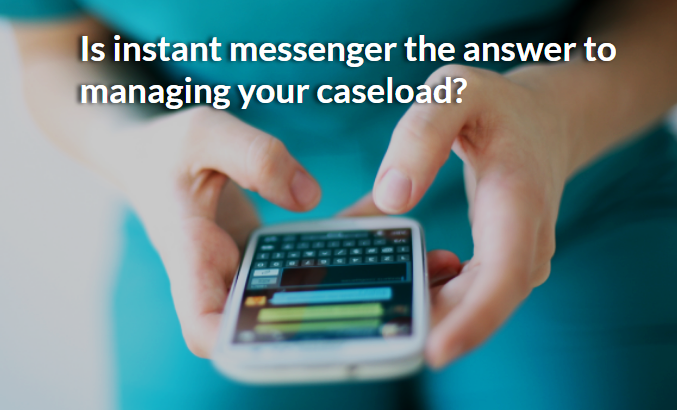 The only downside is the need to implement another system and look for a way to connect your messenger with your client records. Modern day case management systems are becoming better at offering tools for quick and secure data sharing. Many have instant messenger tools built in. Communications can be made in the same instant fashion, from mobile devices, whilst data remains secure with a clear audit trail and link to client files. Cloud based systems also allow for access to client files and documents from any device, anywhere.